Composed by Barry Levenson. Spiral bound. Blues/Guitar Instruction. Book & Play Along CD. Duration 65 minutes. Published by ADG Productions (AD.ADG019-CD). ISBN 1882146328. 11 x 8.5 inches. Exciting Concepts For Blues Guitar Soloing by Barry Levenson is an exciting Blues guitar method (with both music notation and tablature) that explores the techniques found in great Blues soloing. 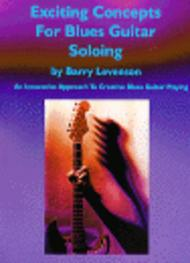 The 14 solos contained in this book comprise some of the greatest "licks" in blues guitar playing. The solos include the playing styles of B.B. King, Buddy Guy, T-Bone Walker, Stevie Ray Vaughan and Hubert Sumlin. The book also comes with a detailed text that analyzes each solo in depth and provides "today's Blues guitar improviser" with all the tools needed for creating their own melodic and harmonic solos. The book gives insight into such concepts as: phrasing, outlining chord structure, target notes, bending techniques, advanced position playing and motific development. The CD is recorded with rhythm backing tracks with and without the solo.